Late in the summer of 2004, I reviewed Vamonos, the first album by Luigi. With former members of Ultrababyfat, The Silent Kids, The Titanics, as well as numerous other local bands, Luigi is something of an Atlanta supergroup, and the members' experience shows in both the quality of their music. Perhaps then it comes as no surprise that Found on the Forest Floor does not suffer from the so-called sophomore jinx, but is instead an improvement over their extremely good first album. The most notable quality of this new album is that Luigi has finally captured the energy and enthusiasm of their live performances. For instance, opener Mariposa begins with a staccato drum beat courtesy of drummer Brian Fletcher before the slightly insistent and immediately identifiable vocals of Michelle Dubois come in. It's a song that moves forward solidly without rushing, much like Luigi's shows. More importantly, it is clear that the band has spent time perfecting these songs through their performances. Therefore, the actual recordings do not drag or have any noticeable flaws, but are fully fleshed out and complete. For a rather unknown local band, it is a welcome change that speaks again to the talent of the band. As I indicated above, there aren't any weak tracks on Found on the Forest Floor. Yet, as with any record, there are songs that stand out above the crowd. And these excellent songs really demonstrate the strengths of Luigi as a whole, so let's examine them more closely. After beginning with the afore-mentioned Mariposa, Luigi goes into Single Cell This song begins with the dominating melodic basswork of Scott Rowe. The guitars begin to jangle and bounce as Dubois sings. Her vocals are fairly up front, but do not dominate, which is a nice recording touch. Then the chorus swells as all the band members provide backing vocals. Single Cell is a memorable dance song in the classic indie rock sense, and should induce most listeners to shimmy around and sing along. In general, this broad sound characterizes most of the album. Another standout is My Will, which is a harder sounding song than Single Cell. The dueling guitars of Dubois and Johnny McConnell stand out along with a call and response vocal line by Dubois and Rowe. This vocal interplay is new for Luigi, but it works well because of the complementary timbres of the two voices. Like many of their other songs, My Will changes tempo a bit when it hits the chorus. As Dubois and Rowe sing the chorus, the backing band comes across with a staccato punctuation that emphasizes the harder nature of this song. The band demonstrates a slower, more introspective side on Failing Eye. With a swaying beat courtesy of some maracas, the focus on this song is the vocal line. Typically, I haven't thought of Dubois as a pure singer; however on this track her voice carries the song as she shows that she does have a range. Likewise, the simple guitar solo stands solidly, without any distortion to hide it from examination. Yet, underneath everything, there is still that ever present jangle, which maintains the overall energy. Wash It Down is the most classic sounding Indie Rock song to my ears. It's got the distorted hard guitars of a Superchunk, the complicated, fun basswork of Poster Children, and the hard hitting drumwork of any number of mid 90s bands. Of course, as usual, the vocal melodies are uniquely Luigi, but the tune feels like a nice summary of bands which have preceded them. Finally, there is my live favorite Sooner, which is ostensible a narrative about Oklahoma. Although the instrumentation has similar characteristics as much of the music, the lyrics of this song are particularly literate and just damn funny. Particularly of note is Dubois's catalog of bands from Oklahoma, which means you get a single verse that cites The Flaming Lips, Hanson, and The Gap Band. For some reason, the juxtaposition always makes me laugh, and laugh in a good way, which perhaps accounts for my fondness for Sooner. Even though I've only focused on a few of the album's 14 tracks, I do need to reiterate that these are only my personal favorites. All of the songs on here are uniformly good. 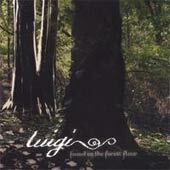 Admittedly, Luigi's music is not perfectly unique or necessarily challenging, which some listeners may not like. On the other hand, I think that Found on the Forest Floor is a near perfect Indie album that is both listenable and enjoyable. To that end, this album is clearly one of the best things I've heard in 2005, and considering how strong this year has been music, that's saying something. Luigi played at Corndogorama in 2005 and 2004. Michelle DuBois, lead vocalist of Luigi, used to be in Ultrababyfat.